My husband had the day off today and decided to use some of his extra time to haul out his smoker. I’ve posted his smoking adventures before (hard-cooked eggs!) and he’s been known to think quite far outside of the (smoker) box for “recipes.” Experimentation aside, I knew I’d benefit come suppertime, so bought him a pack of the best thick-cut pork chops I could find. 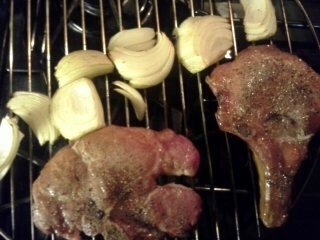 He seasoned the chops, then chopped up an onion and threw it all on the smoker. He filled the water pan with cola, water, and beer and topped the charcoal with applewood chips. The smoker ran low and slow, achieving a maximum temperature of only 200°F. (The windy 25°F outside temp kept him from getting to the 225°F he was looking for.) After two hours on the smoker, the food had to come in for a quick turn in the microwave as we had evening activities and needed to eat. When the pork was at 150°F, we served it up. The onions were slightly crunchy, slightly tender. 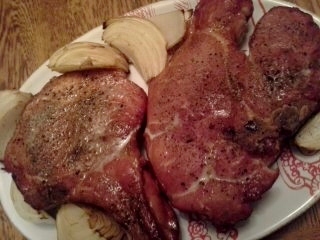 The pork chops were juicy and flavorful. And everything hinted of smoke–perfect. The big surprise came after the meal. 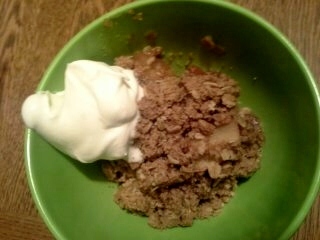 I had seen a packet of apple crisp topping (a thoughtful friend had gifted us with a gourmet crisp mix–thanks, Mary!) and apples on the counter earlier in the day. Who would think to “cook” apple crisp on a smoker? My husband, that’s who. The crisp sat with the pork chops and onions the entire two hours, then needed another half-hour in a 375°F oven to bake the apples tender. When it came time for dessert, I had my doubts that the crisp would be any good–smoke and apples? Color me surprised: it was phenomenal. The apples, buried under the crisp topping, hadn’t picked up any of the smoke. But the buttery, salty crumble on top had soaked up an intense hint of something spectacular. It may or may not have been recognized as “smoke,” but it was something different, something special. A spoonful of sweetened whipped cream was a nice touch–giving it visual, textural, and flavor contrast. 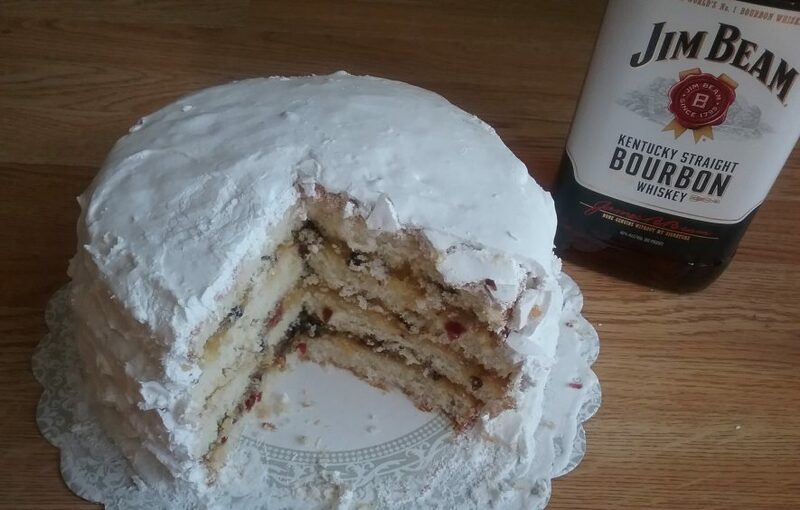 Until today, I would never had guessed that smoking would work for a baked dessert. But it was a fine way to cook up an apple crisp. Oh man — that whole meal sounds awesome, but I am really loving the idea of the smoked apple crisp! I love desserts that take something familiar and put a unique spin on them. Sounds like it’s good your husband is a risk-taker! Funny as he’s really quite conservative. But a smoker brings out a different side of a man, I guess! I’m betting your game meat would take well to smoking as well. ?? Yum.